Sweet pink and orange with white flecks "Town and Country" style Hawaiian Sunrise Shell with Puka Shells pendant! This Sunrise Shell is a beautiful top shell with bumpy, ruffled ribs measuring 7/8 inch, and is accented with two shiny white North Shore Puka Shells. 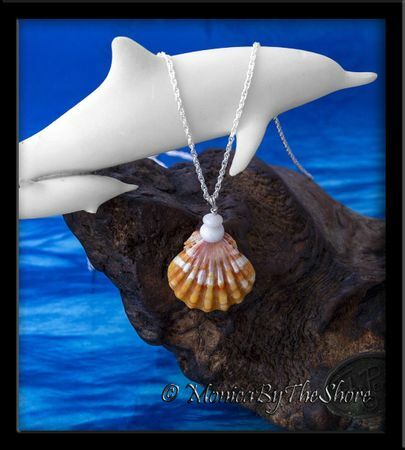 The seashell pendant drapes from an 18 inch sterling silver rope chain necklace. Perfectly beautiful detail in this shell! Get ready for compliments! 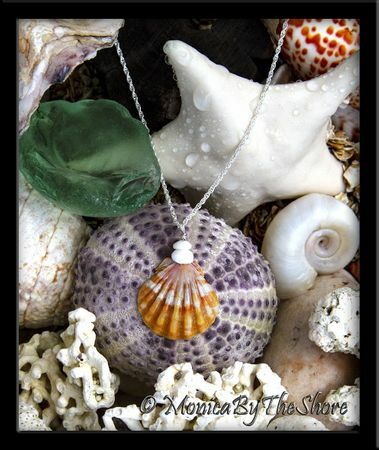 Hawaiian Sunrise Shell jewelry that can be worn in "Town" or "Country"!